This is old version Google Sheets 1.6.273.06.30 apk for Android, you can install it if you want to downgrade or install old app. It is top Productivity apps from Google Inc.. The first is all about the capabilities of editing or creating the spreadsheets effectively. Sharing your works is also possible especially when you need to have team work while you are away each other. It can even keep the file you made in the form of Microsoft Excel files. All the formatting options like adjusting the cells, entering and sorting data, find replace and so on are also available. Now, mobile works are very capable to fasten your business progress. Luckily, it also has auto saved possibilities that bring you less worries about losing the data while you are working. The entire features are fully capable to be accessed especially when you are really addicted to the spreadsheet works. Leave your heavyweight laptop at home and just bring the smartphone in pocket. 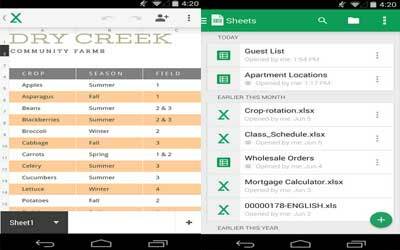 Get Google Sheets for Android as your best partner in making and editing all type of spreadsheet.